Eliminate boring sales meetings and corporate events with hysterical audience participation guaranteed to make your sales message memorable, motivational, and impactful. Magically produce VIP's, keynote speakers and award winners in a puff of smoke or from an empty product box, which will make them heroes, elevating their presentation to new heights. Captivate your sales team and clients, keeping them motivated, interested and at the edge of their seats. Make your message unforgettable with a custom blend of magic and humor, using interactive audience participation creating team building with a sense of wonder and intrigue. From his world renowned multiple award winning Comedy Magic show and Psychic entertainment production to one of the largest touring illusion concerts in North America, Brian Glow Corporate Entertainer and �Master of Illusion� will create an unbelievable magical experience that is guaranteed to amaze your audience. � Specializing in Corporate Events, Casinos, Fairs, Festivals and Cruise Ships. 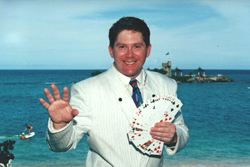 � Magical entertainment for Sales Meetings, Conferences, Conventions, Trade Shows, AGM�s, Grand Openings, Product Launches, Team Building events as well as Publicity Stunts. � Brian Glow's concerts have toured to over 40 countries. � Customized productions for any size of audience. � Comedy, audience participation, special effects, streamer launchers and pyrotechnics. � Shows to fit any venue from banquets halls to arenas. Brian Glow�s Corporate clean family friendly one-man show is an intimate magical comedy production, which utilizes audience members throughout the show. His premier illusion concerts �Glow � In The Dark� and �Smoke and Mirrors� are amongst the largest touring magical illusion concerts in the World, today. His cast and crew provide a glittering backdrop to Brian�s latest illusions. Fiery Illusions, daring escapes with impossible odds, dancers floating in air, assistants being cut into pieces with lasers, people appearing and disappearing in explosions - combine this with exciting dance numbers filled with buoyant choreography, flames of fire, special effects, pyrotechnics, dazzling lights and vibrant costumes and sets to create a glittering stunning world class Las Vegas styled show.